At the age of 22, Valentin Serov was seriously ill. Having received money for the next picture, he and his friends decided to go to Italy. The warm climate of Italy is well influenced by the health of the great Russian artist. There he wrote one of his works – “St. 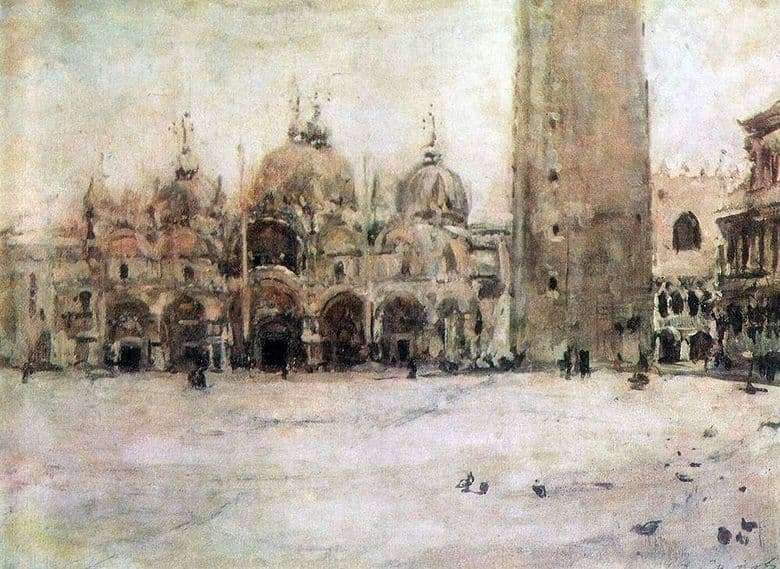 Mark’s Square in Venice”. Venice is a stunning city that for centuries has attracted artists and poets. St. Mark’s Square is the main place of the city. This is where the most important events take place: meetings, meetings take place, couples fall in love and break up here. The beauty of local architecture struck the artist. In the center of the work is the Cathedral of St. Mark. Valentin Serov uses oil paints when working on a picture. He does not draw all the details, but makes only hints, outlines. The color scheme is muted. The artist refused to realistic color images. Choosing pastel shades, the master conveys the relief of Italian architecture. But due to the lack of color, the artist misses and does not show us all the beauty of the cathedral. He made him almost faceless, uninteresting. There is no drawing of ancient mosaics and drawings that adorn the facade of the cathedral. We do not see the stunning marble facing of the building, columns. Perhaps this work is only a sketch. Probably the artist painted in the open air. He went to St. Mark’s Square for only a couple of hours and made a sketch in order to work on all the smallest details in the future. Despite the apparent incompleteness and low visibility of the work, some individual moments in the picture are still drawn. For example, the artist prescribed the location of people walking around the cathedral. These are citizens or visiting tourists, who, like Serov, were captivated by the beauty of the local architecture. The square itself is almost empty: only here and there do pigeons sit on the ancient pavement.